VENTILATION 54 E&MJ • JUNE 2018 www.e-mj.com data being transported in a single cable, which provides a high level of flexibility in the system engineering. Operations can configure and reconfigure the network on the fly, and place Ethernet end-point de- vices anywhere they are required." One of those devices might be Maestro Digital Mine's FanMon primary and boost- er fan-monitoring system which, according to the company, is the first comprehensive and inexpensive fan monitoring system designed to be permanently installed on primary or booster fans. Data from the de- vice is reliable and repeatable, said Mae- stro, because the sensors are always in the same location — while portable vibration systems are dependent on sensor location and are subject to human error. FanMon, according to Maestro, can be incorporated into an alarm or safety shutdown system and provides complete vibration analysis including vibration sig- natures. Through the device's Ethernet output, analysis or signature interpreta- tion can be viewed locally or remotely by the fan manufacturer or vibration special- ist without the need for expensive travel and wait time. A particularly useful feature, said the company, is its ability to provide natural resonant frequency protection. Many fans have resonant frequencies below their nor- mal operating speed; operating at resonant frequencies can cause high vibration levels that, if uncorrected, will cause damage. Depending on which component of the as- sembly is in resonance, the vibrations can cause a wide range of problems, from an- noying noise to destructive failure. Shafts, bearings, and foundations are particularly susceptible to problems with resonance. New fan motors now often use vari- able frequency drives to reduce energy consumption. 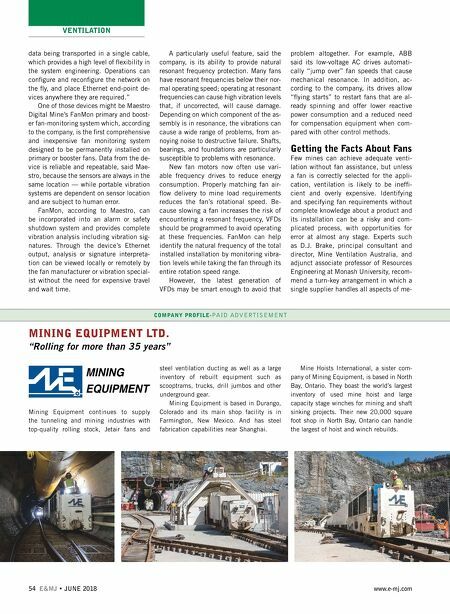 Properly matching fan air- flow delivery to mine load requirements reduces the fan's rotational speed. Be- cause slowing a fan increases the risk of encountering a resonant frequency, VFDs should be programmed to avoid operating at these frequencies. FanMon can help identify the natural frequency of the total installed installation by monitoring vibra- tion levels while taking the fan through its entire rotation speed range. However, the latest generation of VFDs may be smart enough to avoid that problem altogether. For example, ABB said its low-voltage AC drives automati- cally "jump over" fan speeds that cause mechanical resonance. In addition, ac- cording to the company, its drives allow "flying starts" to restart fans that are al- ready spinning and offer lower reactive power consumption and a reduced need for compensation equipment when com- pared with other control methods. 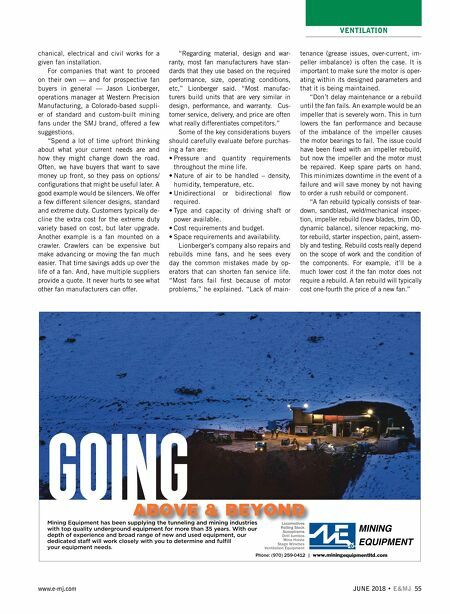 Getting the Facts About Fans Few mines can achieve adequate venti- lation without fan assistance, but unless a fan is correctly selected for the appli- cation, ventilation is likely to be ineffi- cient and overly expensive. Identifying and specifying fan requirements without complete knowledge about a product and its installation can be a risky and com- plicated process, with opportunities for error at almost any stage. Experts such as D.J. Brake, principal consultant and director, Mine Ventilation Australia, and adjunct associate professor of Resources Engineering at Monash University, recom- mend a turn-key arrangement in which a single supplier handles all aspects of me- COMPANY PROFILE-PAID ADVERTISEMENT MINING EQUIPMENT LTD. "Rolling for more than 35 years" Mining Equipment continues to supply the tunneling and mining industries with top-quality rolling stock, Jetair fans and steel ventilation ducting as well as a large inventory of rebuilt equipment such as scooptrams, trucks, drill jumbos and other underground gear. Mining Equipment is based in Durango, Colorado and its main shop facility is in Farmington, New Mexico. And has steel fabrication capabilities near Shanghai. Mine Hoists International, a sister com- pany of Mining Equipment, is based in North Bay, Ontario. They boast the world's largest inventory of used mine hoist and large capacity stage winches for mining and shaft sinking projects. Their new 20,000 square foot shop in North Bay, Ontario can handle the largest of hoist and winch rebuilds.